Chalcedony is a wonderfully unusual mineral in appearance, with a wealth of appealingly popular variations such as agate, aventurine, carnelian and onyx. In ancient times this family of beautiful gems were highly prized for use in adornments and official seals. 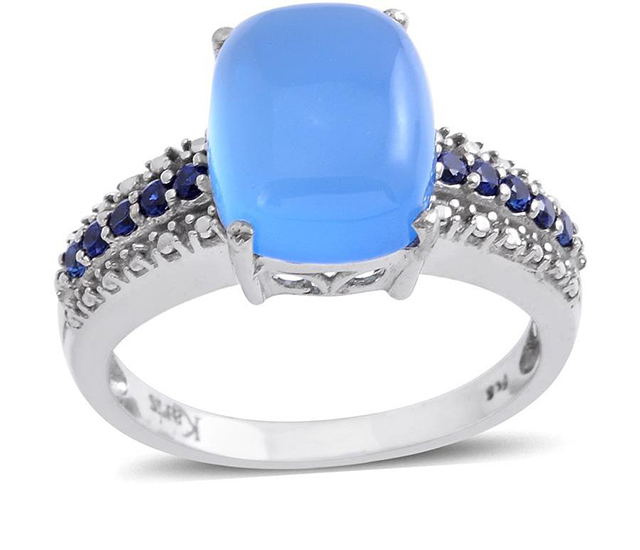 The term ‘chalcedony’ is thought to come from the Latin word ‘calcedonius’, a translation of the original Greek word ‘khalkedon’ which is mentioned in the Book of Revelation. This is debatable however, since other sources insist the gem was named after the ancient seaport of Chalcedon in Turkey. As far back as the Bronze Age, chalcedony was popular in the Mediterranean region, particularly for seals because its composition prevented hot wax from sticking to its surface. The coloured varieties of chalcedony gems span a rich range of colours and patterns, from the deep, opaque green and brown of jasper to the wonderfully original fern-like patterns of moss agate. Rich orange-red carnelians, apple green chrysoprase and deep black onyx are also stunning examples of this versatile family of gemstones. Found in abundance as well as in a wealth of distinctly original varieties, chalcedony is a fascinating mineral that is much sought after in jewellery. Its unique colours and patterns ensure a number of variations of this stunning gem family will be sure to captivate even the most discerning eye. Chalcedony is rated 6.5 to 7 on the Mohs hardness scale, making it reasonably durable in jewellery pieces, however do be careful not to give it any hard knocks. In general, chalcedony is valued according to the standard gemstone qualities - size, cut, quality and type. The colour, clarity and treatment of a stone will also affect its price significantly. The ethereal blue variety of chalcedony is extremely popular in contemporary society and has become a favourite of gem carvers and jewellery designers. Other prized examples include apple green chrysoprase (as mentioned it is one of the most expensive stones in the family), richly black onyx and agate (which features gorgeously striped patterns).